Email images turned off? Click here to see graphically enhanced web version. Please note there is a 6 bottle limit per order on 2015 Syrah due to low supply. Wines can be ordered in any quantity and in any combination. Click here to order your wines today! ​From the warm 2014 vintage comes this lush fruited and complex Merlot. The nose shows damson plum, violets, black cherry, vanilla, Christmas cake and complex baking spices. The palate is soft, rich, ripe and round with intense dark chocolate dipped liqueur cherries, black plums, blueberry, a full body, smooth tannins and liquorice, dried sage and spice notes on the long finish. ​Pair this with rich braised short ribs or rosemary roasted lamb shoulder. 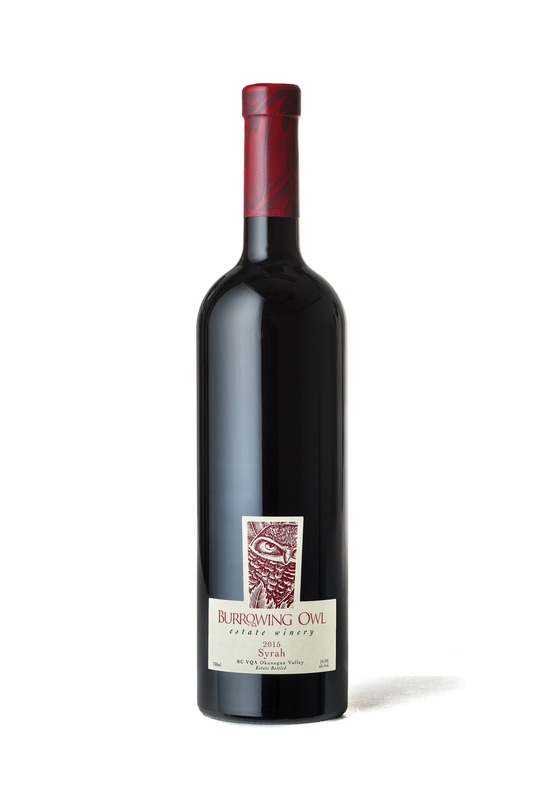 ​A ripe, rich and meaty Burrowing Owl Syrah from the 2015 vintage. The nose shows blackberry, dried blueberry, ripe damson plum and smoky, meaty, bacon, coconut, leather and coffee with some dark chocolate and floral violet notes. The palate is rich and full bodied, and combines charred meat, paprika spice, black pepper and leather with dried blueberry, blackberry, dried fig and some toasty vanilla oak. Pair this rich wine with a beef and black pepper stew or braised lamb shanks. 20th Vintage Celebration & Proprietors' Dinner! Join us as we celebrate our 20th Vintage in fine style at our Proprietors' Dinner in the Sonora Room Restaurant! An autumn reception will be followed by a five-course dinner featuring fresh, local ingredients paired with a selection of Burrowing Owl library wines. The dinner will be hosted by Proprietors, Jim & Midge Wyse, together with Wine Ambassador Sophie Laurent who will share “tips and tastes” about the dishes, the wines, and the pairings. Consider pairing your dinner with a stay at the Guest House (based on availability) but book soon to avoid disappointment. Looking for a good read? The Pellet Post (the Burrowing Owl Conservation Society's quarterly newsletter) is an interesting and informative piece of scientific and conservation literature. The Spring 2017 issue also features a great article on Burrowing Owl Estate Winery's Proprietor, Jim Wyse, who is one of the Society's Board Members. There are few locations in British Columbia that offer the scenic and culinary experience that the Sonora Room offers! The menu is distinctly local and includes freshly harvested, organic produce from Le Petit Clos farm (situated only a few kilometers from the restaurant), and a wonderful selection of our library wines by the glass offering a glimpse into the aging potential of wines available in the Wine Shop. Join us this summer, and experience the essence of wine country dining. Click here to review menus & make an online reservation. We are now taking reservations for 2017 Fall & 2018 Spring Getaways! For updated information on getaway packages to Burrowing Owl's Guest House, check our Specials and Packages page. Karma and Rusty report that the 2017 vines are coming along nicely! While a cool & wet spring slowed things down initially, we are now only about 1 - 2 weeks behind average development. Recently, steady temperatures closer to seasonal norms have definitely sped up development and the vines are catching up quickly! As you drive up Burrowing Owl Place upon a visit to the winery, you will notice that one of our Syrah blocks was recently replanted. We used a slightly different clone that was selected for its winemaking and viticultural attributes, and look forward to watching the vines develop in the years to come!